Prop 37 - Well, What Now? What Happened with Prop 37 and Where Do We Go From Here? 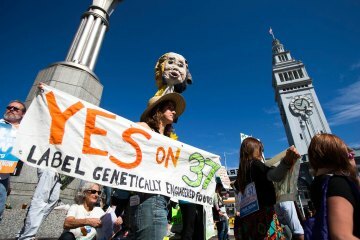 As you have probably heard by now, Proposition 37 – California’s controversial ballot question requiring the mandatory labeling of GMOs - sputtered and stalled in the polls. The proposition failed by a relatively small margin - 46.9 percent to 53.1 percent - leaving the bill motionless and many people upset. The big food industry heavily contributed to “No on 37,” an anti-labeling campaign that spent over $45 million, outspending the pro-labeling camp by roughly six to one. Their large budget facilitated the release of an aggressive advertising campaign which claimed that food prices for California families would increase by $400 per year, scaring uninformed Californians to vote no. We had been watching the Prop 37 debate closely, and like many people, felt wary about the results. Despite the proposition’s defeat, we believe we have reason to feel good about what happened this past Nov. 6th. We met with natural foods movement pioneer and Organic Valley Coop’s Mission Executive Theresa Marquez to discuss the current state of the organic industry and how we can move forward in advocating for greater food transparency. Theresa believes the sun will shine on the mandatory labeling campaign again. The fact that GMO labeling was on the ballot in California, and brought millions of voters to the polls in support, was a success in and of itself. The media coverage has helped propel the issues of GMO policy, research, and transparency to the forefront of the nation’s attention. The press coverage has sparked new discussions, raised the public voice on the importance of knowing what is in their food, and will hopefully bring optimism to GMO labeling on the next ballot. There is also word that Washington State is putting together a GMO labeling law that could be up for voting as early as 2013. We suspect other states will follow. The general sense of optimism is a great sign for the future; with hard working food activists like Theresa Marquez and educated voters at the polls, food reform can be possible. There is still a lot of work to be done, and you don’t have to be in California or a well-known food pioneer to make a difference. Though GMOs are not currently labeled, there are other labels that can help you make better informed decisions at the grocery store. Because GMOs are not allowed in USDA certified organic products, buying certified organic is a 100% guarantee for GMO-free food. If you’re not sure where to start, people have found the Dirty Dozen list to be helpful in deciding which fruits and vegetables to start buying organic. Look for Non-GMO verified products. 1. Vote with your dollars. As sales of organic and non-GMO verified products increase, more businesses will be motivated to serve this growing market. 2. Sign petitions to let key decision-makers know that we want foods labeled if they contain GMOs! As a customer of Boston Organics, you can be sure that your food is free from synthetic chemical pesticides, herbicides, and GMOs. We only source 100% USDA and third party certified organic food for our boxes, and we will continue to make sure that the foods we provide for you and your family are safe, wholesome, and healthy.